Warm Bodies is a fascinating zombie movie a bit unlike any other zombie movie I've seen. And that's a good thing, that someone came along and saw an interesting angle on this genre that's quickly becoming over-saturated in the entertainment industry. 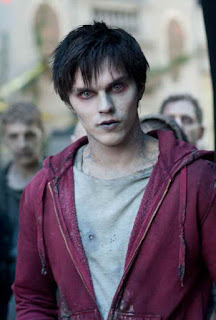 Warm Bodies stars Nicholas Hoult as R the zombie, and Teresa Palmer as Julie. 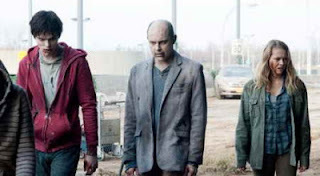 Other cast includes Analeigh Tipton, Rob Corddry, Dave Franco and John Malkovich. It was written and directed by Jonathan Levine (50/50, The Wackness). The movie starts out pretty cute as we follow R around an airport, while he goes through some self-dialog, ambling along. Doing what zombies do. But he's a wee bit different. Sure, he still needs to eat brains, but he does seem to have something more going on in the head. R (It's really all he can say and ends up with that name) lets us know that the world has caught this zombie plague, but he doesn't know how it happened. But then again, like he said, it doesn't matter. It's here, he's dealing with it. And then through various events, he ends up meeting Julie. OK, he kills her boyfriend. Details. But what's curious about these zombies is that when they eat brains, they experience the memories of their victim. So R sort gets a head start on liking Julie. They meet, then he protects her from the rest of the gang. Especially the Bonies. Those are the zombies that are way far too gone to even look human. And this "boy"-meets-girl story goes from there, in a weird and different world than what we're used to. The movie is rated a fun PG-13, and has a runtime of 98 minutes. The story starts out cute and funny, then slows down a wee bit in the 2nd act, but things pick up nicely for the 3rd act. 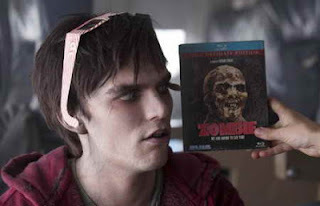 And there are some great little twists and surprises that make this "zombie" movie stand out from the rest. Even if it doesn't look like it. IMDb users rated this movie at 7/10. And surprisingly, critics and fans almost agree over on Rotten Tomatoes, with critics scoring the movie at 80% and fans, a 78%. Wow. Someone mark that in a journal, calendar or something! The movie is not afraid to laugh at itself. Good review Bruce. Overall, this is a good movie with the zombie and romance element not backfiring on them and tells a compelling story with a good chance of them doing it well. Thanks Dan... nice site you have yourself!